This paper explores the endeavours of five small firms to develop Web-based commerce capabilities within their existing operations. The focus is on the strategic acquisition and exploitation of knowledge which underpins new value creating activities related to Web-based commerce. A normative Web-based commerce adoption model developed from a review of the extant literature related to electronic marketing, entrepreneurship, and the diffusion of new innovations was empirically tested. 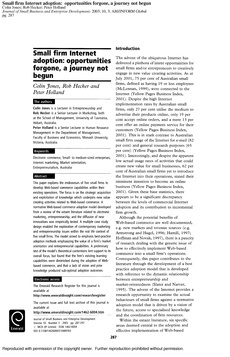 A multiple case study design enabled the exploration of contemporary marketing and entrepreneurship issues within the real life context of five small firms. The model aimed to emphasis best-practice adoption methods emphasizing the value of a firm’s market orientation and entrepreneurial capabilities. A preliminary test of the model’s theoretical contentions lent support to its overall focus, but found that the firm’s existing learning capabilities were diminished during the adoption of Web-based commerce, and that a lack of vision and prior knowledge produced sub-optimal adoption outcomes.